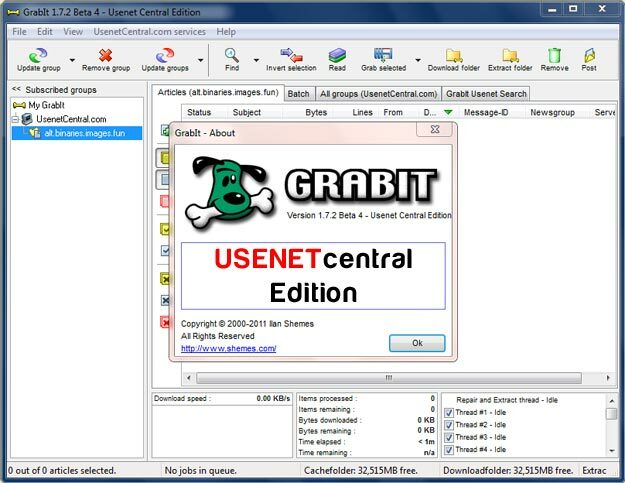 ↪ GrabIt Newsreader | Sign Up for Usenet. GrabIt is one of the most featured packed and easiest to use newsreaders. With GrabIt you can search and download any content on Usenet Centrals news servers, without downloading thousands of article headers. With your Usenet Central membership you'll get access to GrabIt's Usenet search feature ($3.99/month value) absolutely free. Tired of downloading thousands of articles in the newsgroups just to see if there is anything available you want? The GrabIt search feature will instantly find and download all posts on Usenet matching your search keywords! You no longer have to verify, repair and extract your downloads by hand. Fill up your download batch and leave your computer running. When you come back all of your downloads will be complete and ready for you. GrabIt supports the ability to fully encrypt all your traffic to the Usenet server with industry standard SSL technology! Coupled with Usenet Centrals 256bit SSL encryption all of your downloads on Usenet are fast and secure. GrabIt has integrated support for the well known NZB file format. Just load an NZB file in GrabIt and the NZB file will automatically be downloaded. Want to request a repost or thank somebody for their great post? With GrabIt running you don't have to start another newsreader to post a message. Just hit the post button, type your message and GrabIt takes care of the rest!